Cities are supposedly the driving force of the UK economy. So good are they at making money and improving the lot of their inhabitants that there are more and more new calls for devolution to these powerhouses of wealth generation. Cities know best, so let them get on with it is the mantra. Cardiff, Wales' only "Core City"
But what if you are not in a city? Is there any hope? Core Cities UK have this year produced a green paper on the City-led future of Britain. It is available on their website, www.corecities.com. The message is that cities are the best thing that ever happened to the human race, the drivers of the economy and the true shape of the future. 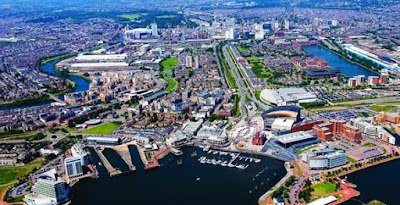 Cardiff is one of the case studies you can look up on this site. Cardiff is a fair way from where I live in Carmarthenshire and I know little about its performance other than the impressive growth of our capital's city centre and its successes as the seat of government and home of many National institutions. Its Core City ambitions are clearly worthy. There are impressive promises, the "Cardiff Commitment" seeking a coalition of change to prepare young people for the world of work. Major businesses and local public service leaders have signed an "employer pledge" committing them to working with schools and accessing skills, tuition. mentoring, apprenticeships and job opportunities for young people. It sounds wonderful, I don't know how feasible delivery is, but you can't argue with the ultimate goal of every young person in Cardiff getting a job or post education training "that allows them to be the best they can be". The population of Wales is around 3.1 million. The three southern cities populations are roughly around 856,000 in total with Cardiff the largest with 361,000, Swansea has 246.000 and Newport 149,000. Official city dwellers on this estimate, make up 27.5% of our population, low by world estimates where over 50% of people are said to live in cities at present, set to rise to 70% by 2050. I recently went to a presentation of this green paper in Glasgow and the enthusiasm of the core city leaders was impressive. However, at the end I could not resist asking some of the Council leaders the question which most Welsh People might ask "what is the future of areas which are not cities?" After a meeting where all parties had criticised the UK Government for its centralisation and "one size fits all policies", the response I got was one emphasising the Cities as the new leaders in growth and economic development, and the need for everyone to work with them, preferably within them. Is that where we non- city dwellers fit in? Join them or condemn ourselves permanently to some second rate economy, poor services and no tools to improve matters was what I understood by the responses. The City lobby is powerful and the UK central government has responded with City Deals and the installation of elected mayors, and these policies will likely be extended to many other areas. Will it all work out ?- I don't know. But I do know that the current trend to pretend that we, the rest of Wales are part of a city or a made up regional partnership area and will therefore share the great leadership, strength and skill claimed by the Core Cities may not be such a good idea. The Core Cities have the begging bowl out already and are competing for UK government funds will well developed investment bids. If a rural area funds a project as a"City Deal" will the illusion it is something to do with a city make it a success? Delta Lakes - it certainly has a lot of water, is a brownfield site, and belongs to the Council. 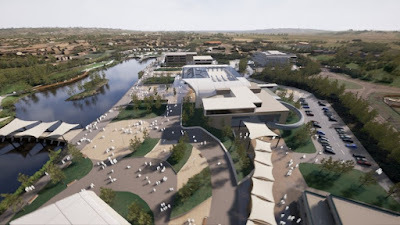 When I asked why we were planning the "Wellness and Life Science Village there I was answered by Mr Mark James, the CEO of Carmarthenshire County Council "Where else would we find 40 acres of land? "Convenience clearly took precedence over careful site selection. Delta Lakes will provide a ‘world class’ Wellness and Life Science Village along the Llanelli coastline bringing together health, leisure, business and research. The largest ever regeneration project in South West Wales, it aims to improve the health and wellbeing of people across the region, creating up to 2000 high quality, well paid jobs and boosting the economy by a staggering £467 million over 15 years. A Community Health Hub offering a range of health and wellbeing services and facilities for education and training. An Assisted Living Village, AKA £7m funds originally earmarked for a council care home. Firm details are scarce. How many of these buildings will be built by the local authority to lease out to businesses, the university, the Health Board and the care home provider, for example? Businesses may be happy to rent units, lease hotels and laboratories etc but is anyone offering to really invest and build and own the units? If not, the cost of construction and landscaping may take up much of the loan money borrowed by the County Council. They rely on the business rates to cover the loan interest - possibly a poor position from which to negotiate the best rental deals. Before the signing of the agreement, I never saw a proper business plan for the scheme. Neither was there any research report as to how many and where the tourists and service users would probably come from. The expressions of business interest were just that. Does the scheme stand or fall as a whole or are the proposed individual schemes viable in themselves? How many of the "up to 2000 high quality, well paid jobs" will actually be recruited locally, where many are already stuck in entry level low paid jobs with little prospect? Maybe pretending to be part of a city will be an advantage? Personally, I believe our rural areas, small towns and villages deserve the sort of economic stimuli generally shown to help these sorts of communities and the businesses and industries they sustain. Jumping on someone else's bandwagon may not the best strategy.